Healthy and easy to make. It's time for some orange and black. Every once in a while something truly inspired comes together without much thought. Maybe it has to do with last week’s Halloween celebration or maybe it has to do with the Giants crushing the Rangers in the World Series that made us think of black and orange. Tonight’s dinner consisted of our last piece of halibut from this summer’s catch in the bay, some left over mashed sweet potato and a little inspiration. It ended up being our tribute dish to the San Francisco Giants and their awesome World Series win. A reduction of balsamic vinegar with a little soy sauce drizzled at the end was all this dish needed to go from bland to fantastic. 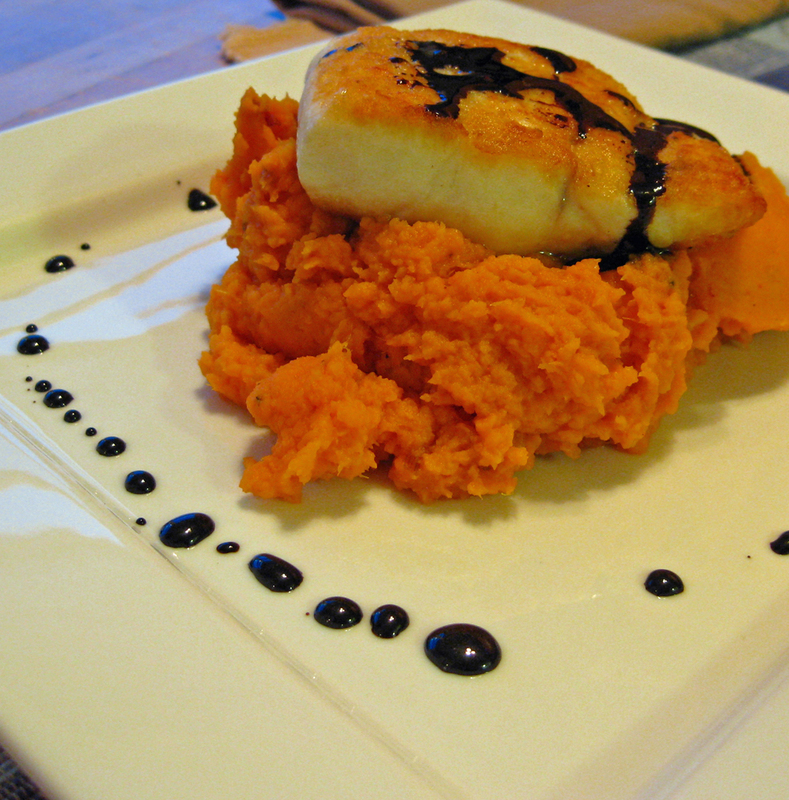 Bake the sweet potatoes in a 450 degree oven until tender, approximately 30 to 40 minutes. Allow to cool and peel or scope out the orange flesh into a bowl. Mash and season with salt and pepper. After potatoes are made, salt the fish, heat a skillet over medium high heat, add the olive oil and sauté the fish for two minutes per side (more or less depending on the thickness of the fish). While the fish is cooking, reduce the balsamic vinegar over high heat in a small skillet until caramelized. Watching the pan constantly to avoid burning. Add the soy sauce and place off heat until ready to assemble. Reheat briefly before serving. Place the fish on top of the potatoes and drizzle a small amount of the balsamic reduction on top of the fish and around the plate. Enjoy!